Welcome to Natural History of the Kitchen, by EMD's Stephanie Butler. Each week, Stephanie explores the background of an appliance, gadget or product that helped to make cooking what it is today. This week: Chef Boyardee. Let's talk about guilty pleasures. What self-professed gourmand doesn't love a bag of Doritos now and again? Is there a foodie out there so devoted to the cause that they can't appreciate a bag of M&M's and popcorn at the movies? I, for one, have a deep love for Chef Boyardee beef ravioli. Not spaghetti and meatballs, not cheese ravioli, not dinosaurs or Dora the Explorer shapes in sauce — just plain beef ravioli, cooked on the stovetop (never microwaved). You'll need a can opener for this installment of Natural History of the Kitchen. 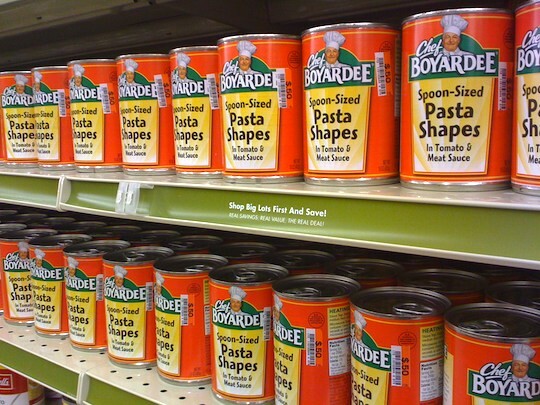 Like Orville Redenbacher and Duncan Hines, Chef Boyardee was more than a script signature above a brand name. Ettore Boiardi was born in Piacenza, Italy, in 1898. He immigrated to the United States, arriving in Ellis Island in 1914 and joining his older brother in the kitchen of the Plaza Hotel. The young Boiardi was something of a culinary wizard, working his way up to head chef and later catering a dinner for President Wilson. Still the youngest man in every kitchen he entered, Boiardi (now going by the name "Hector") grew his famous mustache to make himself look older. At 24, Boiardi moved out to Cleveland to open his own restaurant, Il Giardino d'Italia. His spaghetti dinners were so delicious that customers asked the Chef to sell them his red sauce. He obliged, first distributing the sauce in glass milk bottles and then going through a local cannery. By 1928 the sauce was so popular that he devoted himself to selling it full time. His first products included a ready to heat line of spaghetti dinners – just open the box, and pasta, sauce, and grated cheese were at your fingertips. 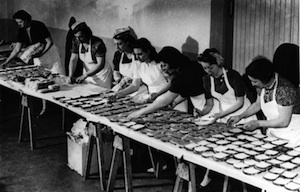 The Chef's dinners gained even more fans during WWII, when his company made troop rations. The popularity of the Italian-lite food grew, and Boiardi sold his company in the 1950s for $6 million. He kept his hand in company affairs, appearing in television commercials and acting as an advisor until just a few years before his death in 1985. Since then the Chef brand has branched out into Teenage Mutant Ninja Turtles pasta, overstuffed ravioli, and vegetarian options. A far cry from a meal at Il Giardino, sure, but a satisfying and comforting guilty pleasure nonetheless. Here's the Chef himself, in a commercial from the mid 50s that would require subtitling for the Italian accent today. 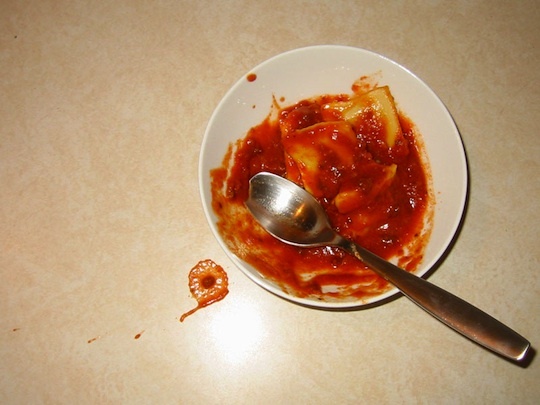 FINALLY someone has shed some light on to the mystery behind Chef Boyardee! My Palermitano friends and I insist that he was from Palermo. . . The New York Spaghetti House on E. 9th Street in Cleveland was opened by the Chef's brother in 1927 (I think) and was closed a few years ago. Ah, childhood memories of eating canned Chef Boyardee raviolis. Haven't had them in years (since growing up and becoming a food snob). I didn't know his history and loved reading it. Great old commercial too. THE DOWN FALL OF ITALIAN AMERICAN CUISINE! GREW UP EATING THE REAL STUFF...NOT EVEN VEGETABLES CAME FROM A CAN! I am a self respecting Italian, but I do eat Chef every once in a while. Sorry, my Nona only makes handmade raviolis for New Years day. And her raviolis are a billion times better than chef. I didn't know (or I had forgotten) that there was a real person behind the brand name. Thanks for the interesting history lesson. Now, who were (Doctor) Pepper, (Mrs.) Dash, and (General) Mills? Dang, A.G. is angry about this. Good thing I'm not a self-respecting Italian (or at all Italian), so I can continue to guiltily enjoy it occasionally. Thanks for the info about Chef Boiardi! I always wondered how the pasta got its name. 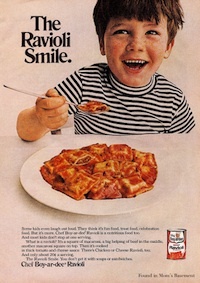 I used to LOVE the beef ravioli. Was never allowed to eat it as a child, so when I went to university I ate it as often as I liked . . . . until. Oh NO! I feel so old... I actually remember seeing these commercials as a child. 15 cents per serving-things have changed dramatically since then. Thanks for your post. I found it very well researched and quite interesting.